Israel and the Hamas militant group edged closer to a ceasefire to end a weeklong Israeli offensive in the Gaza Strip, but after a day of furious diplomatic efforts involving the U.S. secretary of state, UN chief and Egypt's president, a deal remained elusive and fighting raged on both sides of the border. Israel and the Hamas militant group edged closer to a ceasefire Tuesday to end a weeklong Israeli offensive in the Gaza Strip, but after a day of furious diplomatic efforts involving the U.S. secretary of state, UN chief and Egypt's president, a deal remained elusive and fighting raged on both sides of the border. "If there is a possibility of achieving a long-term solution to this problem by diplomatic means, we prefer that. But if not, then I am sure you will understand that Israel will have to take whatever actions are necessary to defend its people," Israeli Prime Minister Benjamin Netanyahu said at a late-night meeting with visiting U.S. Secretary of State Hillary Rodham Clinton. In a meeting with Netanyahu, UN chief Ban Ki-moon condemned Palestinian rocket attacks, but urged Israel to show "maximum restraint." Egypt's new Islamist government is expected to play a key role in maintaining a deal. The crisis has thrust Egypt's president, Mohammed Morsi, into the spotlight as he plays a difficult balancing act. Earlier, Morsi raised hopes that a ceasefire was near when he predicted the negotiations would yield "positive results" during the coming hours. Netanyahu also said his country would be a "willing partner" in a ceasefire agreement. "Most likely the deal will be struck tomorrow. Israel has not responded to some demands, which delayed the deal," Hamas official Izzat Risheq said. Hamas officials refused to discuss the remaining sticking points. 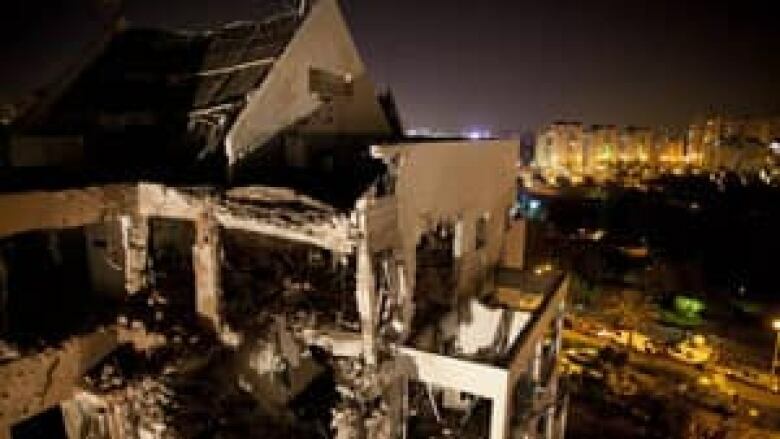 Israeli media quoted Defence Minister Ehud Barak as telling a closed meeting that Israel wanted a 24-hour test period of no rocket fire to see if Hamas could enforce a truce. Palestinian officials briefed on the negotiations said Hamas wanted assurances of a comprehensive deal that included new border arrangements — and were resisting Israeli proposals for a phased agreement. The officials spoke on condition of anonymity because they were not authorized to talk to the media. More than 1,400 rockets have been fired at Israel, including about 200 on Tuesday. A U.S.-financed Israeli rocket-defence system has knocked down roughly 400 of the incoming projectiles. Israeli warplanes dropped leaflets on several Gaza neighbourhoods asking residents to evacuate and head toward the centre of Gaza City along specific roads. The army "is not targeting any of you, and doesn't want to harm you or your families," the leaflets said. Palestinian militants urged residents to ignore the warnings, calling them "psychological warfare." Clinton was also scheduled to meet with Palestinian President Mahmoud Abbas in the West Bank and Egyptian leaders in Cairo on Wednesday. Turkey's foreign minister and a delegation of Arab League foreign ministers travelled to Gaza on a separate truce mission. 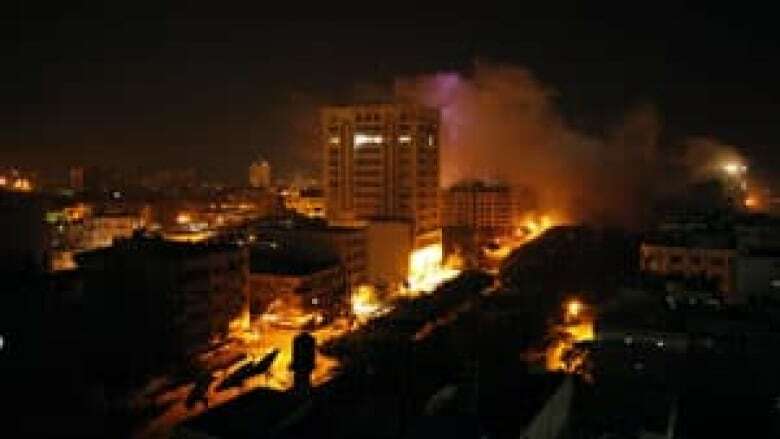 Airstrikes continued to hit Gaza even as they entered the territory. The U.S. considers Hamas, which has killed hundreds of Israelis in suicide and other attacks, to be a terror group and does not meet with its officials. The Obama administration blames Hamas for the latest eruption of violence and says Israel has the right to defend itself. At the same time, it has warned against a ground invasion, saying it could send casualties spiralling.